*I know, they’re professionals. What are they supposed to do? Just head back to the clubhouse and say, “We’ll get ’em tomorrow”? –In the bottom of the fifth, Bryan Price sent Josh Smith to the plate to pinch-hit for Cody Reed. Yes, Josh Smith, the pitcher. Smith doubled, of course. He then proceeded to pitch two shutout innings of relief. –Michael Lorenzen followed up with two innings of scoreless relief as well. –Adam Duvall got what Reds’ broadcaster Chris Welsh described as a “Little League home run.” He lofted a fly ball to right field that was botched by St. Louis’ Stephen Piscotty. Somehow, the official scorer ruled that a triple — at some point, we have to have a discussion about the state of official scoring in this league — and the Cards proceeded to throw the ball into the stands, allowing Duvall to trot home. Of course, after the replay was shown, Duvall was sent back to third base because of supposed fan interference when the ball went into the stands. So the Cardinals botched the play in two different ways, but it shows up in the box score as a triple. Who knows? 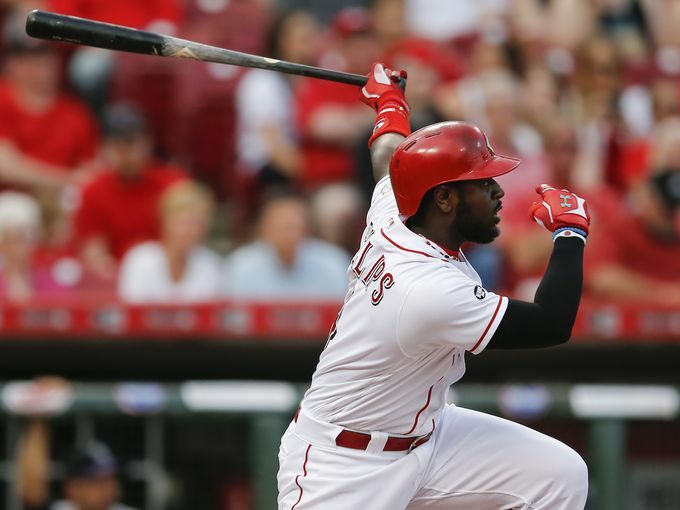 Either way, Brandon Phillips — who went 2-4 with 2 RBI on the night — drove Duvall in a couple of pitches later. –Joey Votto collected a first-inning single, extending his hit streak to 17 games. Tyler Holt singled and walked out of the leadoff spot. 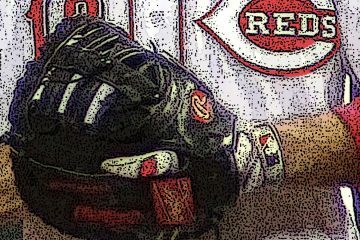 –Scott Schebler, playing right field tonight, leaped over the wall to rob a St. Louis home run. 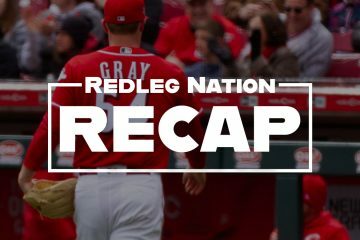 –Another rough start for Cody Reed: five runs allowed on eight hits in five innings. He actually gave up four of those runs in the first inning — and that was the difference in the game — but Reed never seemed comfortable the rest of the night (and gave up a bunch of hard-hit balls). I dunno, maybe he needs to go back down to AAA, for his mental health, if nothing else. I’m of the opinion that he can’t learn to get big league hitters out if he isn’t in the big leagues, but I can see the utility in sending him down to Louisville for a little while to get his head straight. If you saw his post-game interview, he’s at a loss right now. I’m on the record as saying we need to be patient with these young pitchers, and I haven’t changed my position on that point at all. I still expect Reed to be a good major league starting pitcher. If I ever get to the point that I’ve given up on a 23-year-old pitcher with 40.2 innings behind him at the major league level, it’ll be time to find another game to obsess over. –Phillips got picked off at first base in the third inning when it appeared that he was paying almost no attention to the pitcher. –Zack Cozart wasn’t available again tonight. Hopefully he’ll be back tomorrow; playing with a shortened bench didn’t help the Reds tonight. –One-run loss, but an entertaining game. Reds will just have to win the series tomorrow afternoon. –This bullpen is almost fun to watch right now. Never imagined I’d be able to type that at any point during the 2016 season. –Kinda disappointed that Schebler didn’t hit another walkoff, even though he didn’t actually bat in the ninth inning. What I believe to be Reed’s changeup is 86 mph…his fb is 93 or so! He isn’t coming inside to lefties at all so they just lock in to smashing the ball the other way. Let him regroup in Lville. Lamb has a 1.72 era down there since he went back. Bob Steve was decent tonite and Sampson has good stuff. Lets try that. Agree on Reed and L’ville. I also agree that he needs to at least try to come inside against LH hitters. He didn’t work inside much to the RH hitters either. You can get killed if you miss in there and you can hit guys throwing in there, but you are certainly going to get killed if you never throw in there. The difference between change and fastball isn’t really great enough. I didn’t notice an issue with arm speed or arm slot though, so that’s good. I still think Reed will be a good MLB pitcher. Chad is right about giving up on 23 year old pitchers with just over 40 MLB innings. I think Sampson deserves a few more starts. Thought it was odd the announcers kept repeating that the Reds had no hitters besides Cozart left on the bench, despite the fact Renda was. Weird. Wow, I guess so! Oh well. Thanks! Feel bad for Cody Reed. That post-game interview was telling in that he has lost his confidence. He said, “Hopefully I get the ball again in 5 days and we’ll see what happens.” That use of “hopefully” shows that he isn’t even sure now if he’ll get to go back out. Maybe a few weeks at AAA is what is needed. Schebler did have a chance in the bottom of the 8th to tie the game or even go ahead with Duvall at 2nd base and 2 outs. But Seacrist blew one by him. With RH Mike Leake going tomorrow Schebler probably gets another start. He’ll have some more chances tomorrow. Maybe bat him second if Cozart doesn’t play again. Reds should send down Reed today, call up Hernan Iribarren- according to the Redbirds website he has thrown 3 innings of no hit ball with a K. Not sure about his Def but he plays 2B and OF hitting .320. I know he is 32 but if they are so worried about the bullpen that they got to carry 8 pitchers, he can be the emergency mop up guy. Send Reed back to AAA and let Sampson take his spot in the rotation. Or call up Adelman and let him take Reed’s spot. I believe Reed has reached A point where he needs a breather at AAA as opposed to trying to work things out at the MLB level. Make sure he knows specifically what it is he needs to work on in order to avoid him just going down and being a man among boys. Adelman was optioned when he was activated from rehab a couple of days ago; won’t be eligible to be brought up until 10 days after the option date. So, let Sampson take that spot for now; or, bring up R.Stephenson for at least a spot start. Bear in mind that Stephenson already has made 21 starts this season which is among the most in the org. He is just over 120 innings (combined MiLB+MLB) with his work tonight after finishing the last two seasons in the mid 130’s. He could go to ~160 innings just finishing out the the last month at AAA; so, I’m not certain if he really figures into the September call up scenario. Very true about giving Reed an agenda upon sending him down. Give him some specifics to work on. Let him improve and fine-tune and then bring him back up in September perhaps. You know, there used to be a line of thinking — or maybe it was just baseball announcer fodder — that said a pitcher who lost a lot of games, even a 20-game loser, must be a decent pitcher, if the team kept sending him out there. I always wondered whether it was because the team just didn’t have anybody else. …. At any rate, I’d just as soon Reed go down to AAA, if only for 5 or 6 starts. He’s getting hit around so badly that I’m not sure it does him any good to stay in the bigs, and it’s costing the Reds more of his service time! I like the sentiment and I generally agree with you, however, after watching his post game interview his confidence appears shot. I think he needs to down to AAA to build his swag up and start believing in himself again. If we send Reed down, it’s for four or five starts then he’ll be called up in September. I can live with either decision of keeping him here or maybe trying to boost his confidence with a quick visit to Triple A. He seems shell shocked to me. If they were interested in actually trying to win this series and get Reed’s confidence level back up before the September call-ups, they should him down today. Move Finnegan to the bullpen and start Disco, have an extra players since they only have AAA catcher, a AA infielder and AAAA OFfor a bench with Cozart hurt. Would not hurt to have 1 more replacement player but I guess Josh Smith probably could pinch hit. I made similar comments about Lamb a couple of weeks ago, but I think that Reed’s learning curve in the majors right now is very limited and he needs to take a step back to AAA, re-establish his confidence, and work on secondary pitches against lineups that won’t almost automatically tattoo his experimentation and learning. I have by no means given up on the guy, I do think there could be something very special there, but he’s clearly not ready for prime time. (But I have this feeling we have 4 more weeks of him as a regular rotation participant until getting September previews of Stephenson, and perhaps Garrett.) BTW, the fish were biting in northern Ontario, but I found a way to get on the fishing camp’s tinkertoy version of the internet each day and check in things on RLN! The Reds play with with a shortened bench even if everyone is healthy. There is no need to carry 13 pitchers. Desclafani is able to go deep in games as is Straily. Finnegan to some degree and Bailey should be soon. Iglesias and Lorenzen and Smith and Sampson (who hasn’t pitched since when?) can all pitch multiple innings. Roster management needs to improve we need a bat ff the bench. Until people mentioned him here I had forgotten Sampson was on the roster still. Reed must learn to get big league hitters out.Its not always about stuff which he has but it can be a mental thing.He just needs some confidence.He will be fine but I am all for finding out at the big league level.Big league hitting and pitching are a different ball game and sometimes it takes awhile. Margin of error is just razor thin. Everyone in MLB is an excellent ballplayer but definition. The short bench thing goes back to the Dusty days.Do you really think we have anybody that can manage a roster?I have never seen it happen effectively.Just think about it.Peraza goes down and Cosart misses the first two games of the series.Go figure.Wouldn’t you think that before roster moves are made that part of the process is you ask the question who is banged up?Why the need for 13 pitchers? Some haven’t pitched in days and I mean days.The Reds seem to not get the most basic stuff when it comes to running a team.Its just plain dumb to go into a game with 3 guys on the bench and 1 of them is your back up catcher. A couple things. Thing one is Cozart was 100% fine when they sent Peraza down. He was a late scratch because he hurt his finger in batting practice. That’s at least my understanding on it… Thing 2 is that you don’t generally DL a guy, especially one of your starters, unless you think he’s going to be out at least a week. Why DL a guy and have him miss 14 games when he may only need to miss 5? Your last point is what I’m on board with. The Reds may have needed to carry 8 relievers for a while but they don’t really need to right now. Why not option one of those guys out (or Reed) and bring up a bat for the bench today? Perhaps because Selskey is hurt and Waldrop is only available as an injury recall until the 10 day waiting period after he was optioned to make room for Bailey expires? Leading up to Hamilton’s injury (24 games), Hamilton slashed .325/.349/.446. After coming back from his injury and leading into the all star break (22 games), Hamilton slashed .169/.235/.260. since the all star break (17 games), Hamilton has slashed .290/.347/.319. In Reds wins this season, Hamilton has an OBP of .326. In Reds losses this season, Hamilton has an OBP of .278. This team needs Hamilton getting on base and when Hamilton gets on base, his engine leads the train. I was glad to see Price give Hamilton a day off yesterday. Hamilton looked like he needed a break. Here’s hoping that Hamilton will lead the Reds to another series victory against the dang Birds today. The Old Cossack has been steadfast against Hamilton hitting in the leadoff position or anywhere at the top of the lineup, but if this team is going to succeed, I think they need Hamilton hitting leadoff now and hoping that Hamilton has finally made the adjustment for long-term improvement in getting on base. My goodness, if he even gets on base at a league average clip, he'[s a runaway locomotive pulling the Little Red Train behind him. That #2 hole question, the answer might be Schebler. I like how he’s worked the count and been more patient lately. No, he shouldn’t be looking for a walk but he needs to swing at hitters’ pitches. He has been seeing a lot more pitches in general. That’s a good thing. I have always been a big fan of Bryan Price …………as a pitching coach. I can’t understand as a pitching coach he caught every little thing a pitcher did now he is blind. Reed has a reoccurring nightmare every time out and if it is not mental then someone needs to teach him different. He leaves the ball out over the plate and gets hammered it is the aversion to throwing inside, if he is afraid he might hurt someone he will never be a pitcher. When he tries to go inside it looks like he lets up and not only does the pitch drift right into hitting off the “T” it flattens out and has no movement at all. When he is pitching outside the velocity is a couple of MPH higher and the ball is lively but inside to either side of the plate batting practice +. I would also add Suarez’ defense to the positive column tonight. He was very much above average. The last two days have made me start to wonder if I’m wrong about Suarez and he is capable of at least being average in the field. The guy sure has a cannon for an arm based on some throws he’s made. If he keeps using a leather glove instead of cast iron I’m going to be a much happier fan. Suarez is learning at the big league level to play third base.The more he works at it the better he will become.I really wish he wouldn’t field everything off to the side but they don’t call it the hot corner for no reason.He is a player I feel with a big upside.His bat plays. Yesterday, one of the very good plays Suarez made down the line at 3B was exactly this type of situation. Rather than reaching for a backhand stab,, Suarez shifter his body in front of the hard smash. The ball took a big hop on him, but he was able to adjust and make a very strong throw for the out. If he had stabbed at the ball, I’d wager the smash goes for a double down the line, or a 2-base error.